Shortly before starting our Make University Summer Camp, I received a GoPro camera for my birthday. Wanting to find fun projects for the camera, I started researching different GoPro projects that would be doable for our summer camp. I ended up finding these projects which use a GoPro camera and a ceiling fan to make a homemade Matrix-style camera. 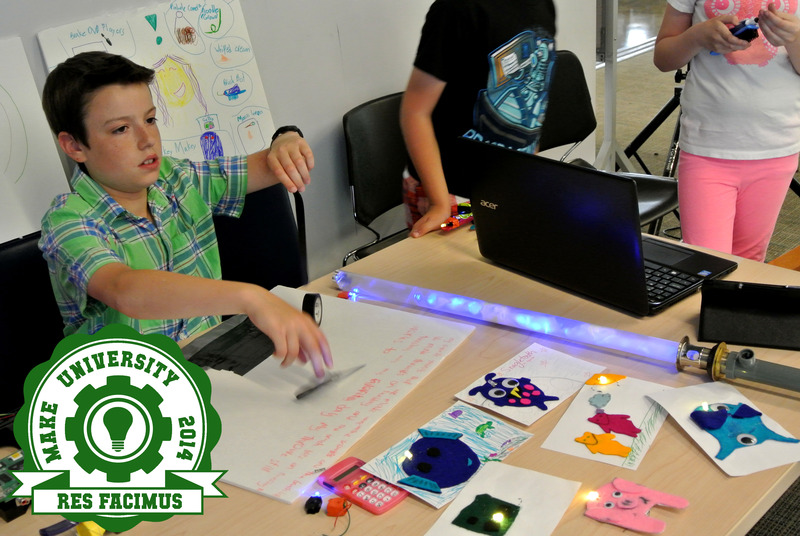 The projects struck a balance of being interesting, safe, and practical within the limitations of our summer camp. In short, the camera seeks to replicate the 360 degree panning camera from the Matrix movies by attaching a GoPro camera to the blades of a ceiling fan. The camera rotates at high speed around a stationary object. Since we’re normally used to cameras being stationary while filming moving objects, the DIY Matrix camera provides us with an unfamiliar perspective. To build our camera we purchased a ceiling fan, a second-hand table, and some electrical cord. We drilled a hole in the centre of the table and mounted the ceiling fan facing upwards. Since our ceiling fan was made to be wired directly into a home’s wiring, we had to wire an extension cord onto the fan. To mount the GoPro to the fan we used a bracket and attached the bracket and camera directly to one of the wooden fan blades. Our rig may not have been the prettiest thing ever created, but it functioned well, allow the GoPro to rotate around a stationary platform in the centre of the table. If you’d like to make your own, I recommend watching this video. Our campers enjoyed playing with the camera. We were able to stream the GoPro’s feed to a tablet, allowing the campers to watch in real-time as the camera worked. However, we found that the campers got bored before we were able to show them the final project, because the videos need a touch of editing to make them a finished product. If we were to try this activity again, we’d probably leave more time after class for video editing and then have a movie showing the following day. Also in a Matrix camera-2.0 we’d consider making a rig that a person could stand in the centre of, similar to the one in this video. While this would add an extra element of danger (swinging cameras make for easy black eyes), I feel that the final product would be more impressive. Here are two of the test videos we created in class. Look for more test videos on our Youtube channel. The ceiling fan is being shipped to London from Victoria, so when it arrived look for a DIY Matrix camera right here in the Forest City.